It was a significant birthday milestone for one of the BarFlys – special enough that we decided to do a double vacation with a trip to Chicago to celebrate with a few friends, immediately followed by a vacation from the vacation in Maui. Our next several posts will feature some of the amazing eats and drinks from both locales, and then we’ll return to posting about our favorite city, San Francisco. 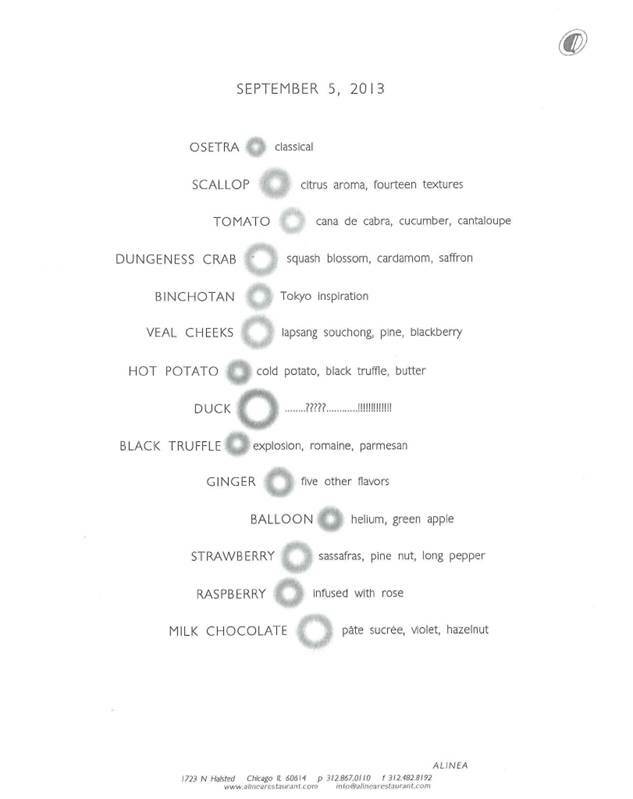 We have said before that Alinea is our best meal experience ever (sadly we never did make it to El Bulli). We have eaten at a few other Michelin-starred places since first dining there six years ago, so it was a natural choice to return for the special occasion and see how it compares to our favorites. We are happy to say that it remains our top dinner destination, even as the experience has changed from six years ago. When we first went to Alinea in 2007, we managed to make same-day reservations due to a cancellation; this warranted a shopping trip to Banana Republic since jackets are required. Back then, they offered a choice of a tasting menu or a grand tour menu comprised of 26 courses. We opted for the full experience of the grand tour with wine pairing, and our amazing dinner lasted just about five hours, well past midnight. This time around, they have moved to a ticketing reservation system and offer only a single menu of 14 courses. The highly orchestrated experience is a more manageable three hours, yet the meal was no less grandiose than our initial encounter. Owner-Chef Grant Achatz ensures a memorable evening with plenty of science and interactivity, accompanied by a bit of tableside theatrics. Although we had pre-purchased two tickets for dinner that include all service charges and taxes, any drinks were to be purchased at the dinner itself. We decided to pass on the wine pairing this time around. We hadn’t seen the menu at this point, but the sommelier confirmed that a bottle of white for earlier courses and a bottle of red wine for the later courses would pair well. For the white wine, we selected the food-friendly Von Buhl 2010 Forster Pechstein Dry Riesling Grosses Gewachs (GG). We started drinking Rieslings a few years ago after a trip to Alsace showed us what this grape offers when it is made properly dry: crisp acidity and minerality that drinks well with fish and white meats. The course that followed the ginger set us up for the dessert courses. The Green Apple Balloon was impossible to photograph since the servers handed each of us a completely edible floating helium balloon. We did our best to bite into the ballon to inhale the helium and do our best munchkin impersonation. Unfortunately, we were not able to completely succeed as the balloon started to stick to other parts of our faces and hair. Once imploded, the entire balloon including the string was edible — very reminiscent of a mash up of a Jolly Rancher green apple flavored Charleston Chew. It was a totally fun and interesting course that brought out the inner child of all the diners. Owner-Chef Grant Achatz is well known for his extensive career under Thomas Keller at the French Laundry. He moved to Chicago in 2001 and turned the now-defunct Trio into a dining destination before breaking out on his own with Alinea in 2005, where he has earned three Michelin stars year after year. He and his staff continue to evolve the dining experience by making it more interactive and exploring new food boundaries. 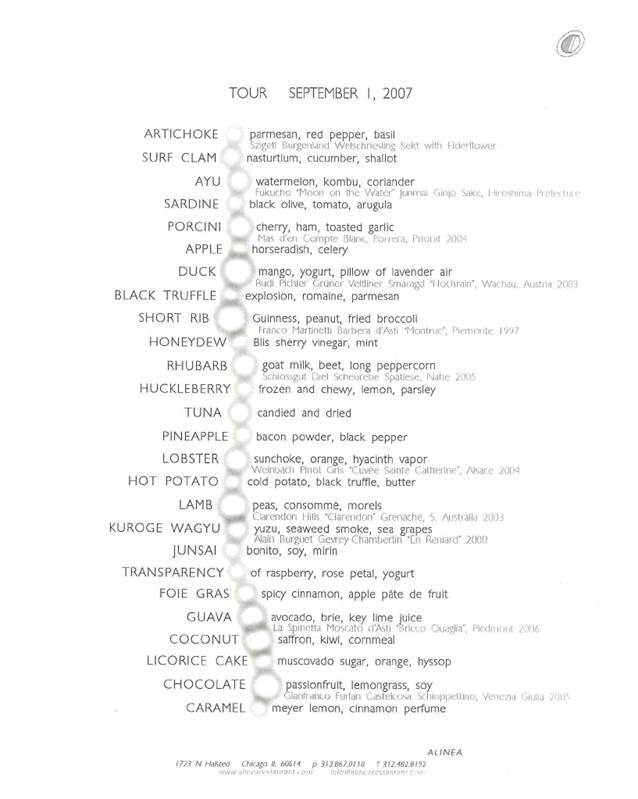 Alinea uses a lot of modernist techniques, but unlike some restaurants they are not gimmicks that becomes the main focus. We have said in the past that Alinea is our top dining experience. Although this visit was very different, this post should give an idea of how memorable an experience it is. Wow! A really stunning and memorable dinner! Ciao Ilaria, It was a great meal and we hope that you will one day go to Chicago to experience it yourself!